The partnership between Russia and India, as it applies to the Sukhoi designed Pak-Fa, may be in trouble. India’s commitmerouble. India’s commitment of R&D funds, totaling 5.5 billion, is seen as a necessary investment to fully develop Pak-Fa, and bring the design into service in both the Russian and Indian Air Forces. While draft contracts for the proposed R&D joint venture have been exchanged, the overall contract has not progressed beyond the draft stage at this point. Several snags have cropped up, that could potentially scuttle the joint venture altogether. India reportedly wants access to all technical data, and to be more than just a monetary contributor, by directly contributing to the overall R&D effort. Technology exchange is a factor seen in several other Indian defense procurement deals, so it should come as no surprise that it is an Indian desire for this partnership. In an effort to further their own defense industry, Indian technology exchange demands make sense. India is also reportedly seeking a prohibition on sales of the aircraft to countries other than Russia, and India. Due to heavy reliance on export orders by the Russian defense industry, this could be problematic for the deal as a whole. Lack of widespread export could easily lead to upwardly spiraling airframe costs, due to a lack of economies of scale. The head of the Indian Air Force, Air Chief Marshal Browne, has stated that the FGFA, as Pak-Fa is known in India, is on hold for now. Browne went on to state that the R&D contract would require another year, and until such time as technical details are provided, financial terms could not be discussed. From India’s standpoint, I can see the reasoning behind the path they are taking. To put it mildly, Russia burned India on INS Vikramaditya, in terms of overall cost, and schedule. That situation left India feeling a bit like a cash machine, being repeatedly abused. Lacking a cash infusion into the Pak-Fa program from India, it is possible the program will become financially untenable for Russia. Compound this with India’s desire to prohibit export orders, and the financial sense Pak-Fa offers falters even more. Its very possible India is facing a choice, between the partially developed Sukhoi, or the already developed Rafale. Defense dollars need to be invested wisely, and in Indian defense circles, the Sukhoi may not be seen as a sound investment. 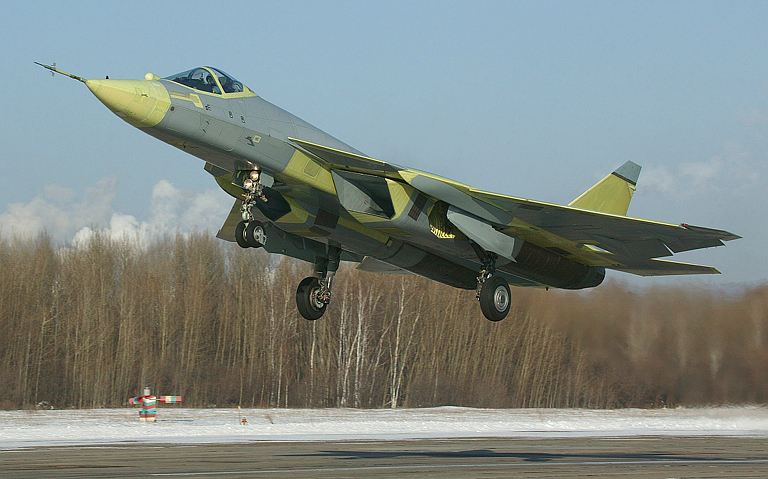 Will Pak-Fa go the way of many other aircraft to emerge from Russia, that never went beyond the prototype stage? Its too soon to tell. The fact that hardware for the Pak-Fa, such as radar, have been developed and shown to the world, points towards a large Russian commitment to the aircraft. Lacking an Indian investment, and commitment for airframes, the Pak-Fa might never see service within the Russian Air Force in large numbers, or with many envisioned capabilities. The moral of this story is developing modern aircraft is an expensive proposition, made affordable and possible by international partnerships. For those who would point to the Chinese J-20 as an example against this, I would remind them of the J-20’s use of Russian engines, and the possibility of the J-20 design coming from the abandoned MiG 1.44 program. ~ by arcturus415 on October 6, 2013.